Andy is the complete package. Having started his career in Formula Ford, Andy has successfully moved up through the motorsport ranks and competes internationally in both GT and prototype classes. The Blancpain Endurance Series in the Bentley Continental GT3 with Bentley Team M-sport. Within that year Andy’s career highlights included a second place finish overall in the Blancpain Endurance Series as well as second in the drivers championship in 2014 with Bentley, a fourth place finish at the 24 Hours of Le Mans 2010, as well as being the highest placed rookie on the extremely competitive grid in the same year. In 2015 Andy continued to compete internationally at the top level of sportscar racing. As an Official Bentley Boy, Andy maintained his relationship with Bentley Team M-sport lining up alongside British teammates Guy Smith and Steven Kane to contest the 2015 Blancpain Endurance Series. Alongside the factory drive, Andy continued his endurance duties with Don Panoz and the DeltaWing team in North America which continued throughout 2016. In 2017, Andy’s driving efforts continued to be versatile, competing with Bullitt Racing in the McLaren 570S GT4 in the GT4 European Series Northern Cup as well as with Motorsport98 in the Ligier JS P3 in the Michelin Le Mans Cup. Alongside this Andy is a Performance Manager for Team UK and has been for over 5 years as an MSA Qualified Coach with unparalleled experience in performance, mentoring and coaching. 2018 saw Andy back with the same two teams. Bullitt opted for a change to the Mercedes AMG GT4 and it was a successful year for the team, including a win at Spa with co-pilot and team owner Stephen. In addition, Andy also teamed back up with Team Parker Racing in the Bentley Continental GT3 for the Spa 24 Hour. 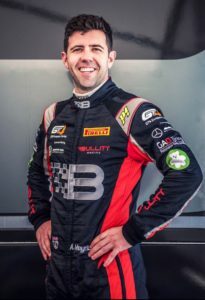 Andy returns to Bullitt Racing in 2019 and will drive the #33 Mercedes with Stephen Pattrick once again. 2019 also sees Andy undertake a new challenge as a BRDC Director. Andy is now responsible for the management and coaching of the BRDC’s SuperStar program in addition to his racing and coaching duties as Performance Manager with Team UK.